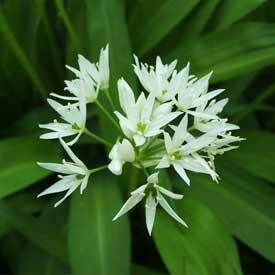 Wild garlic, also known as ramsoms or creamh in Irish, (Allium ursinum) are the most common variety of wild garlic found in Ireland. You will find them in woodland areas, alongside streams and wet ditches in early Spring. They have similar properties to cultivated garlic, they benefit the heart and blood circulation, are antibiotic and balance gut flora. Both the leaves and flowers have a strong garlic flavour. The leaves can be eaten raw in salads or lightly steamed or added to sauces and soups. The flower buds can be added to salads for a lively taste and visual appeal. You can harvest the leaves in early spring, they taste best just before the flowers are ready to open. 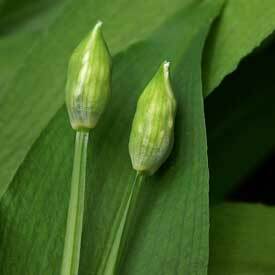 Ramsons are easy to identify but can easily be visually confused with Lilly of the Valley, to be sure you have wild ramsoms just break up a leaf in your hand to release the identifiable smell of garlic. Put ramsons leaves in a blender and cover with cold pressed unrefined olive oil and the juice of a lemon. Add pine nuts, walnuts or sunflower seeds and blend until smooth. Alternatively use apple cider vinegar in place of lemon juice. Either way the results taste delicious! If you cut yourself while out foraging, crush some ramsoms leaves to make a poultice and apply to the cut to prevent infection.